It has been ten days since I last posted a note and, despite several attempts at posting new content, I promise that the time in between has not been all together wasted … I have been learning, or at least attempting to learn, how to make a few adjustments to the site. Having celebrated the first anniversary of The Holly Tree Tales with the most wonderful surprise of many post likes and some new Followers too, delighted at the fact that the blog seems to be moving steadily now … in writing and arrival of new interested Readers … I then hit a wall. Do you have days when you set out to make a great alteration or improvement to your website or blog, thinking that you can see the way forward clearly in your mind’s eye, but then fail miserably when faced with several open tabs across the top of your screen, as you battle your way back to the clarity that you possessed before sitting down in front of it? Well, I have had a few of those sorts of days recently and, Murphy’s Law, they have appeared soon after ‘celebrating’ one year on the Road of the Blog. It is utterly maddening and frustrating and I can only think that, if there is a lesson in here somewhere, it is making me a finer and more agile manipulator of all things communication. Today, at my wits’ end, I have wished that sitting nearby or hanging over my shoulder were a team of bright tech folk, ready, willing AND able to lend a hand to get me back onto my strengthening but wobbly Blogger feet. However, I am completely alone here through most days, living out in the sticks, and have no idea how to even call the WordPress Happiness Engineers for one of their charming cyberspace hugs. So, I have ‘printscreened’ all of the facts collected, carefully saved into yet another Word document to refer to another day, and am going to keep praying for Enlightenment. What is the thing that I am trying so hard to achieve, you might ask? Simple, really: I am trying to add a footer to the bottom of The Holly Tree Tales’ site, saying © The Holly Tree Tales 2016. I have followed (at least I thought that was what I was doing) all sorts of instructions, WordPress and otherwise, but do you think I can get any closer to the prize? Nope. It has simply not been meant to be … and I promise I have tried until I was almost perspiring the endless cups of Rooibos or organic berry teas I’ve been drinking this week (having decided to cut down on the tannin I was consuming via my multiple cups of organic Earl Grey every day) … Eish. That’s “fed up” in mod speak. And what else have I been trying to do … apart from the rest of life, obviously? Well, I chanced upon the notion that my blog, which uses the Hemingway Rewritten Theme (a Premium one, that is) supports a Static Front Page, amongst its various other bells and whistles. Understand, please, that I am spending precious pennies on the running of this blog, pennies that are not in plentiful supply right now, nor renewable, in the hope that soon my head will be clear enough to make the pennies chink more loudly and waterfall-like into my ready hands, in all manner of ways. For now, I optimistically invest a not-inconsiderable amount annually, to have this written internet presence and I really and truly want it to work well. However, I have yet to see the light as far as something as simple as getting that Static Front Page set up … and still have a number of other areas in the Blog that need, and have been waiting a long time for, updating and more flesh. If your journey into the blogging world has been full of pits and nasty surprises, fear not: you are not alone. I might even say, we’re in this together. Let no one convince you that being a Blogger is an easy feat. It is not. Not unless you were born wearing a Tech Design hat, or have been schooled in the fine art of this secret science. Over time I am sure that The Holly Tree Tales will become better and easier to manage, and more worthy of the loyal and wonderful Readers who so kindly spend their time on the content collected under the shade of The Holly Tree Tales’ branches. I thank you all for being here still … I will, eventually, get this figured out and into some sort of rhythm, I’m determined. As with so many things in life, I realise that it is in the letting go that we receive that which is most elusive, if it is meant to come towards us, and so I am letting go … and hoping that somehow all will soon fall into place. PS. The pic above was taken three days ago, on Saturday 9th January at 8.00am. The sun had done its best to rise and delight me … but two minutes later, it had disappeared. 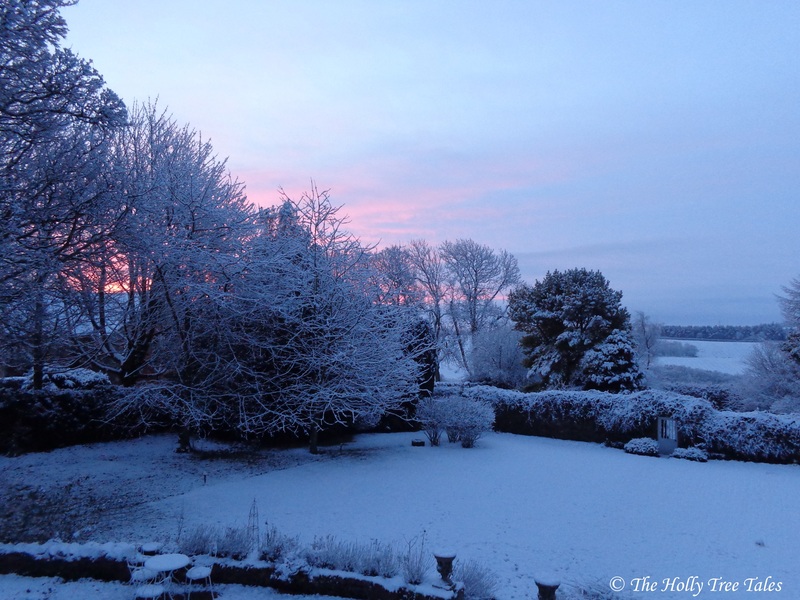 The snow was beautiful though, a lovely change from all the muddy fields around here at the moment.